Henry Richards Caselli was present at the opening ceremony of the School of Mines, Ballarat (SMB) on 26 October 1870. He served as a member of the SMB Council from 1870 until October 1883 when he resigned. Caselli assisted in the planning of many of the new SMB building during that time. Born in 1816, Falmouth, Cornwall, Caselli served an apprenticeship with a large ship building yard, Ferguson & Co., for around 30 years where he studied naval architecture. While there he invented an improved gun carriage and platform, visiting Germany to supervise its erection and by which he attracted the attention of the British Military authorities. He emigrated to Australia on the Gazelle arriving in Geelong in late 1853 where he accepted the position of Lloyd's Shipping Company surveyor for Corio Bay Harbour. Shortly afterwards he was attracted by news of gold and travelled to Ballarat where he witnessed the Eureka riots. After working as a gold miner at Pennyweight Flat, Dalton's Flat, Eureka, and elsewhere, Caselli decided to move into house architecture. In this capacity he planned such buildings as The City and Town Fire Brigade, The Mitchell Buildings (Myers), Ballarat College, Ballarat Orphan Asylum, and many churches including the Congregational, St Alipius (Ballarat East), St James (Little Bendigo), Ebenezer, Holy Trinity (Sebastopol), and the second Congregational Church (Dawson Street). He also was commissioned, with Figgis, to draw up the plans for the Ballarat Female Refuge in Scott's Parade in the early 1880s. Caselli was a strong supporter of the yacht and rowing clubs, a leading member of the Church of England, a Royal Arch Mason and the chairman of the Band of Hope mining company. Caselli died from pneumonia, aged 69 years on 3 March 1885 at Ballarat, and is buried in the Ballaarat Old Cemetery. 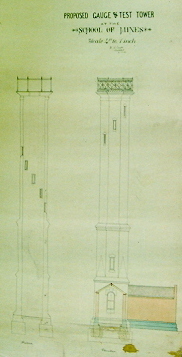 Image caption (RHS): Caselli's Plan for the SMB Gauge Tower, 1880. 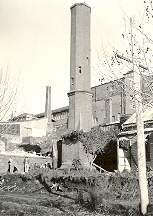 The Gauge Tower was erected in 1883 at a cost of £335. 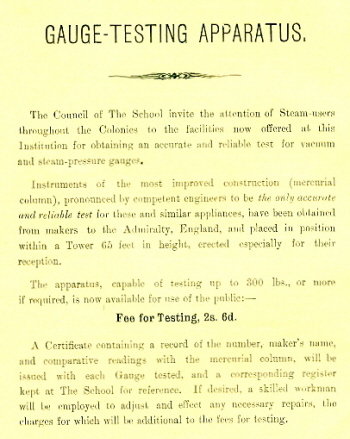 The tower provided apparatus for calibrating steam and vacuum gauges(Cat.No.6199). Image caption (RHS): SMB from Albert Street featuring the Gauge Testing Apparatus. Harry Brew's caretaker's Cottage is on the right hand side. Harry was an old sailor and was an expert in bugs and 'crawling beasties'.